to run for the seat once held by Barack Obama in the United States Senate. Jackson will announce her candidacy for the Democratic Primary next month. opportunity. That's what my candidacy will be about." privileged few on the inside while the rest of us on the outside look on." people to jobs and preparing and training people for jobs. children, and our elderly, to whom we owe so much," she said. Carole Mosley Braun and President Barack Obama. be honored to serve the people of Illinois in that United States Senate seat." 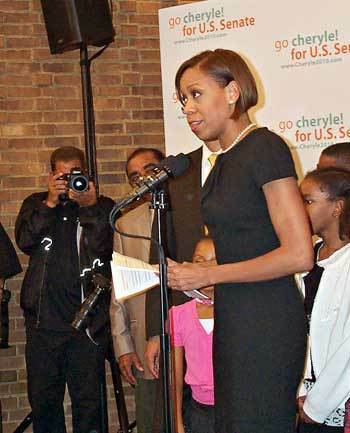 Urban League President Cheryle Jackson is officially in the race for a U.S. Senate seat from Illinois in 2010. Her only rival in the Democratic primary at the moment is state treasurer Alexi Gianoulias. DON WADE: There are critics who say you are tainted as a candidate because you were the deputy chief of staff for Gov. Blagojevich. How do you answer that? JACKSON: Yeah, I'm glad to get that question. I don't know, maybe about 10 million people voted for the governor when he ran. And they voted for him because they believed in the change that he would bring, and that he would make a difference for families, that he would help working families, help bring health care, make it more affordable, accessible for families. Those are things that people got excited about -- and I was excited about -- and that's why I went to go work for him. A political rookie who was a top aide to former Illinois Gov. Rod Blagojevich announced Monday that she intends to run for the U.S. Senate seat once held by President Barack Obama. Chicago Urban League President Cheryle Jackson's entry into the race makes her the best-known black candidate to seek the seat that has been held by three of the nation's four black senators in modern times. The Senate's only black member — Roland Burris — currently holds it. He is not seeking a full term because of fundraising troubles. Jackson's candidacy would mark the entry of an African-American into the Democratic race for a seat with a history of black officeholders, including President Barack Obama, Carol Moseley Braun and its current occupant, Blagojevich-appointee U.S. Sen. Roland Burris. While Jackson could benefit from her ties to national Democratic activists, she will face questions about her association with the disgraced Blagojevich, Illinois' first Democratic governor in a quarter century. Blagojevich was thrown out of office in January following his arrest a month earlier on federal corruption charges that included allegations he tried to sell the Senate seat Obama vacated for the presidency. Cheryle Jackson, president of the Chicago Urban League and former press secretary for ousted Illinois Governor Rod Blagojevich, announced this week that she will run for the Democratic nomination to the U.S. Senate next year. Jackson, 44, was a former Ameritech vice president before working for Blagojevich from 2003 to 2006 and taking over the Urban League. She will face state Treasurer Alexi Giannoulias in the primary. “I want to focus on the economy, jobs, I know a little something about that, helping to create jobs, supporting entrepreneurs to create jobs, connecting people to jobs, preparing and training people for jobs,” Jackson told the Chicago Sun-Times. Former Chicago Urban League President Cheryle Jackson made it official last Wednesday -she's running for the United States Senate in next year's election. A likely candidate since the summer, Jackson, 44, officially kicked off her campaign last Wednesday on the South Side, using BJs Market and Bakery, 8734 S. Stoney Island, as the backdrop for her announcement. The small business was helped by Project NextOne, an Urban League initiative spearheaded by Jackson to promote economic recovery and job creation. John Meyer, owner of BJ's, introduced Jackson, saying: "I have a special relationship with Cheryle. I was a member of the last class of the NextOne program. It was a phenomenal program; it let me learn more about my business, but most important, about myself.